I could do a list of 50. Heck, I could do a list of 10 from Asheville groups alone. These songs were generally released only on 45rpm seven-inch two-siders, some in small batches of a few hundred copies at most. They may have been “all the rage” for a month or two at their local high school, sold at teen dances, handed out to friends and nearly forgotten a year later. My generation can relate them to the occassional demo tape cut by thousands of bands only to end up in a few closet shelf shoe boxes. 1. Dayv Butler & The News (Fayetteville, NC) – The Boy Who Only Smiles. The first single by The News on the minor Salisbury, NC Music Unlimited (MU) label. This one cut in late 1967 was followed up by the more widely reissued fuzz monster “Blue Shoes.” Dayv (stage spelling for Dave) and friends had previously cut two 45s for Jimmy Capps Productions (JCP) as The Delmars. Dayv also wrote with/for Kip Anderson and Johnnie Taylor, getting his name in some writing credits on Stax. A great songwriter, Dayv reflects equal admiration for Elvis and The Beatles in his work, throwing in some wild guitar riffs and great pop hooks. His bandmate Jay Spell achieved much renown on the keys and arranging with Jimmy Buffett for “Cheeseburger in Paradise” and was a well-respected Memphis studio player appearing on dozens of recordings by famous artists. Dayv and Jay are sadly no longer with us, but their music, however neglected, still brings a smile… as the title of this one suggests. 2. Rudy Wyatt & The Roots (Greenville, SC) – It’s Been A Long Journey. 1965 and way ahead of the curve. Brooding teen disaffection with great vocal sneer. Life on the road already being portrayed as wearisome by 16-year-old Rudy. Tapes of several early Rudy recordings ended up in the hands of Major Bill Smith of Fort Worth, leading the uninitiated to suggest that this was a Texas group. Soon redubbed The Wyld, Rudy’s garage goodness has made fond fodder for a great many compilation records in more recent years. This is the one that started it. So good that the LA band Allah-Las chose to cover it on their first single, also appearing on their first LP and a favorite live staple. 3. The Paragons (Charlotte, NC) – Abba. Brilliant, anthemic ’60s pop… could have sold a million. Didn’t. Where were all the promoters and big label cats napping when this one was floating around? The Woggles recognize it’s simple perfection and recorded a cover with their own signature flair. Arguably the finest Carolina has to offer. More “yeah, yeah, yeahs” than you can shake a tambourine at. Teen essence in two minutes. 4. Nova Local (Chapel Hill, NC) – John Knight’s Body. Excellent production and thankfully only one track from an entire LP worth of great material. Psychedelic pop excellence. Also offers the unusual murder ballad motif to the genre. “I miss Mom and Dad.” Not your every day cool kid refrain. 6. 18th Edition (Statesville, NC) – Sundown. Gorgeous Brit pop sounds… finely crafted melody offers convincing evidence that some Carolina kids heard The Move and liked it. Stripped somewhat of the early pop-psych nuances heard here, the group delivered a respected LP while calling themselves The New Mix. 7. Corporate Image (Fayetteville, NC) – Not Fade Away. Wet reverb thwack! The classic tune divorced from it’s Bo Diddley beat and delivered breakneck. You could hurt yourself dancing to this… especially at our age. An early excursion for Willie Lowery, who handed in some fine music with his later groups Plant & See and Lumbee. 9. 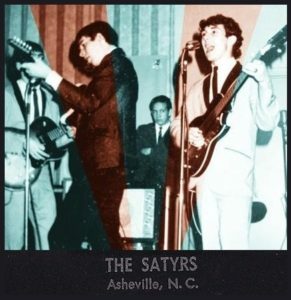 The Satyrs (Asheville, NC) – Don’t Be Surprised. This one created the 50-year undertow which pulled me in. 1965… recorded with two microphones in a hi-fi shop on a cold dark night. The songwriting is stellar by teen standards. Super raw recording captures enough testosterone to power a mid-sized American city. Bucky Hanks presages the cracked falsetto of Neil Young… or maybe his high-lonesome bluegrass roots were showing. This take features full-blown screaming adrenaline in one of garage rock’s most hysteric guitar breaks. They went on to record some excellent polished demos in a professional studio (Mark V, Greenville, SC) a few months later, but this is where it’s at for the LIVE flavor. The unreleased session has it’s highlights, however, such as the “Off My Cloud” attitude of “Ticky Tacky” wherein they shrug off an ailing teen romance like yesterday’s news. 10. Dan Nix & The Teen Sounds (Spartanburg, SC) – I Know. Frantic drumming and freight train guitars with a dark Roy Orbison vocal. Ominous and atmospheric… you’ll love it!